Stephen Foskett is an active participant in the world of enterprise information technology, currently focusing on enterprise storage, server virtualization, networking, and cloud computing. 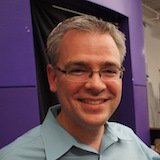 He organizes the popular Tech Field Day event series for Gestalt IT and runs Foskett Services. A long-time voice in the storage industry, Stephen has authored numerous articles for industry publications, and is a popular presenter at industry events. His contributions to the enterprise IT community have earned him recognition as both a Microsoft MVP and VMware vExpert. He can be found online at TechFieldDay.com, blog.FoskettS.net, and on Twitter at @SFoskett.